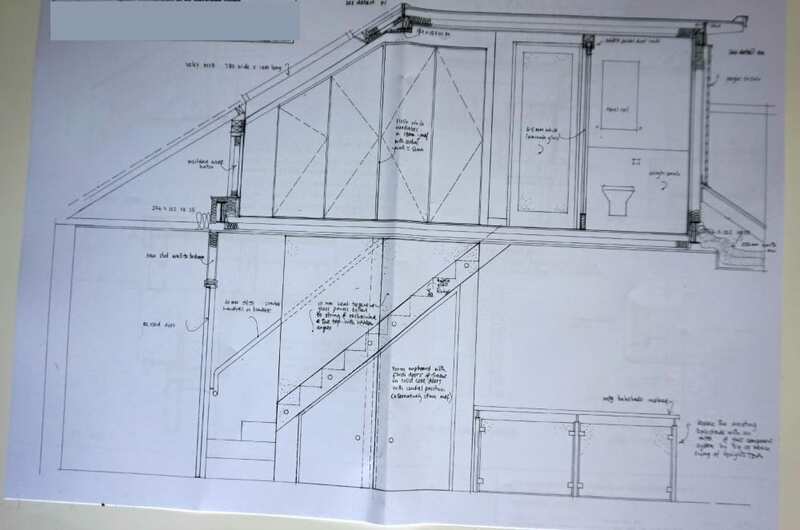 As you may know from this post we commissioned an architect at the end of last year to begin drawing plans to convert our attic space into a bedroom and small en-suite. That last post looks at the initial plans plus a detail of the process so far. Well, things have moved on a little now so I thought it was about time I gave you a further update. The architect delivered the final plans about a month ago. The include lots of detailed drawings plus a schedule of work that goes to all the builders to enable them to pull together their quote. There were several things that excited me about the final drawings. Firstly, it was great to see the full detail. For me it’s about where lighting and plug sockets will go, plus the spec on some of the finish. For my husband it was about joists, steels and insulation. Gosh, we’re such stereotypes! This is the part that I was really chuffed with. At the last-minute we decided to replace our old Victorian styled (I think they’re original) balustrade with a contemporary glass and stainless steel set, and the architect has carried this idea into the design adding glass on the upper staircase too. Instead of it being boxed in by a new stud wall, it will be open and light, contained by safety glass. For the practical amongst you, you’ll be thinking about the sticky finger marks no doubt, but I just thought about the overall finish. I’m so pleased with this layout. From the last post, you’ll know we have a storage unit now, and many more things have found their way there, and the last big job we did was to declutter the attic. Here’s a list of how the process has shaped up in the last few months. 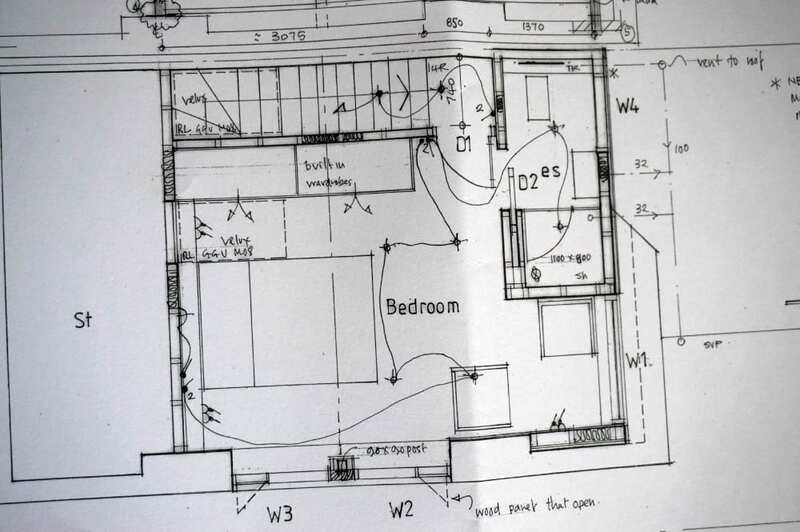 The drawings came by email which I guess varies from architect to architect and we took a good look at them. They included a list or schedule of work that the builders use to quote on and do the work. Once we agreed them, the work went out to tender. Our architect handled all of this and liaised with 5 different builders, giving them 2.5 weeks to put their quotes together. Most of them were late (although Easter feel in the middle) but they did all come back with prices. Many were what we expected with a couple being a little lower. None of them were wildly over or under but were within each other by about 8k. We spent an hour with the architect talking through the quotes, discussing builders’ thoughts and previous work and decided upon one. That wasn’t easy but the architect and his company have experience of working with them a lot, and gave us good advice on how to proceed with payments and management. We’re not hiring the architect to oversee the work, we’re going to do that ourselves. I’ve been in touch with, and hope to meet up with the builder again shortly. We know he and his team aren’t available until the summer, but that’s going to work out quite nicely for us now. I’ve still been looking for pieces to include in the bedroom, and after pulling together this moodboard recently I was keen to get hold of a chair for my dressing table area. I know I want to mix up the styles a little and not stick to one trend or look, so I’m happy with mixing the more contemporary designs with something older and more vintage. 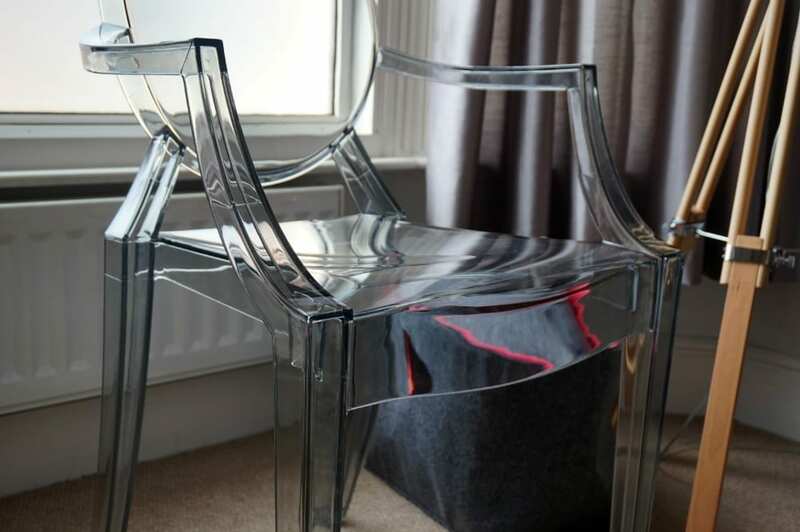 This Ghost style chair from MDM Furniture is just perfect, and I love it in this smoked finish too. As you can see, at the moment it’s sitting in my living room as our bigger armchair has broken, and whilst we await another this does just fine. We can also port it into the dining room as an extra chair at the table when guests come for lunch. It’s become quite cool to have a mish mash of dining chairs so I’m really happy with the look. 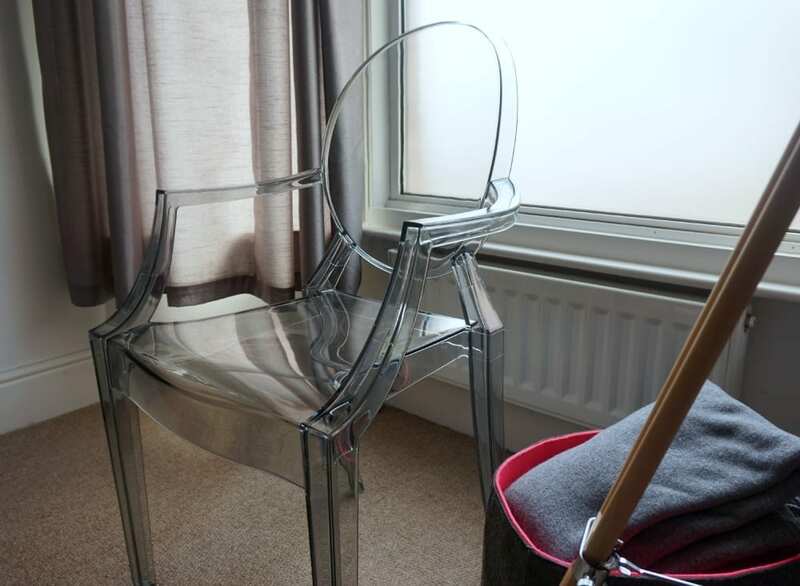 MDM Furniture has a lovely selection of chairs for both the home and garden, in great designer styles. From designer chairs, to rocking chairs and bar stools in all different colours there’s a fabulous range, there’s even a collection for your garden. So the next step? Well, I guess it’s planning in the work to start, which will possibly be around July. It’s later than we anticipated but at least the children might have finished school when the really dirty work begins, and we can take them away for a few days. I’ll be back in the summer with another update – watch this space! Good luck with the new converson it sounds absolutley amazing, what a lot of detail the architect has gone into. I bet you can’t wat for it to become a realist. Also love those ghost chairs, so iconic. Thanks Jenni, yes there’s loads of detail from the architect which the builders need I guess. Seems like we’ve been planning it for years!